Track durations on this release are incorrect. Track durations below are as shown on the centre labels. Side B on this original 1986 pressing contains two tracks not listed on the label (here listed as Untitled Mix 1 and 2). Both tracks are of a DJ tool style with isolated vocals, basslines and melodies etc. Bootlegged with almost identical label information in November 2008. Repress about to drop in April 2014. 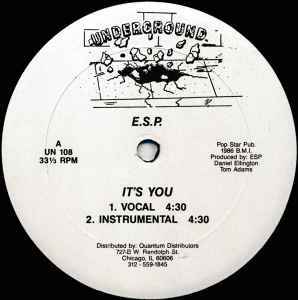 The instrumental is the one for me on this 12". A very basic track with a simple but effective production. A deep late night groove that's hard to believe was released in 1986.